I had already walked nearly eight miles, feeling tired but content. It was a warm afternoon on the Florida Panhandle, and my husband and I were exploring the recreation areas of Eglin Air Force Base, which is the size of Rhode Island. For an annual $20 fee, I could roam the open areas of the base all year round, though each day all hikers and recreationists are required to check which sections were open and which are closed. Pines towered on either side of the trail, signs of a controlled burn blackening segments here and there. 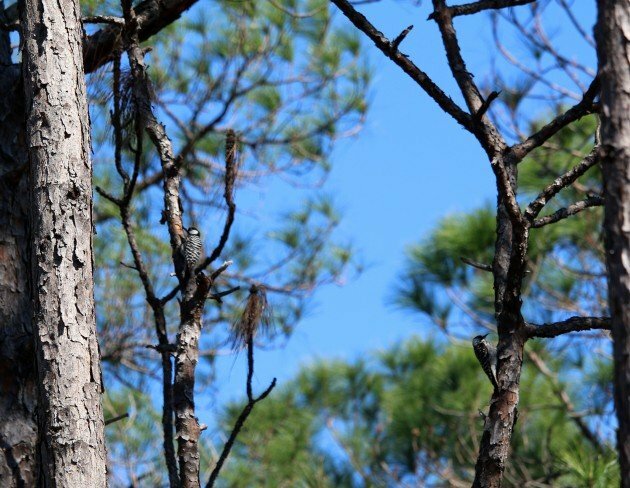 I liked seeing the management – it meant the habitat resembled the fire-dependent forests that once covered this region of Florida. It also meant Red-cockaded Woodpeckers could be nearby. Their past nesting trees were painted with bright white stripes, and as we walked we spotted more than a dozen such trees. Red-cockaded Woodpeckers are rare. They need live pines for nesting, in open forests maintained by fire. As a result of development and loss of their habitat, their populations have vastly declined, and they have been listed as a federally Endangered Species. 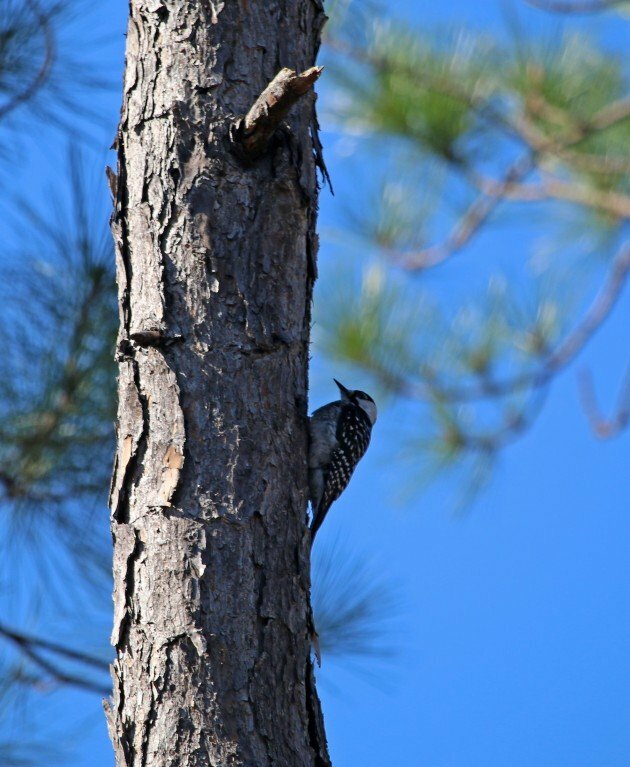 The forests of Eglin are currently protected from destruction because they are essential to the base’s mission, and as a result they host one of the region’s largest colonies of these unique woodpeckers. This was my second time on the recreation area specifically looking for the woodpecker, and it looked like another bust. We had been walking for over two hours, but had no luck spotting their small silhouettes or hearing their high-pitched, squeaking calls. As often happens when birding, I had just about given up on seeing the Red-cockaded Woodpecker when not one but two suddenly appeared, less than a mile from the parking area. The pair of Red-cockaded Woodpeckers busily working up and down two thin tree trunks. My husband and I shared silent whoops of delight, careful to avoid making any noise that could scare them. The birds were right in front of us, rapidly traveling up and down pine trunks and across horizontal boughs, periodically obscured by long pine needles. At first glance they appear much like Downy Woodpeckers, but on closer inspection their backs lack the white stripe of Downies, and they have a larger white cheek. My husband, after I remarked on the likeness, immediately insisted that they were way cooler looking. I had to agree. We watched quietly for over ten minutes as the woodpeckers busily went about their business. Males and females are almost impossible to distinguish in the field (especially because I forgot binoculars – oops! ), but we guessed this was a nesting pair. 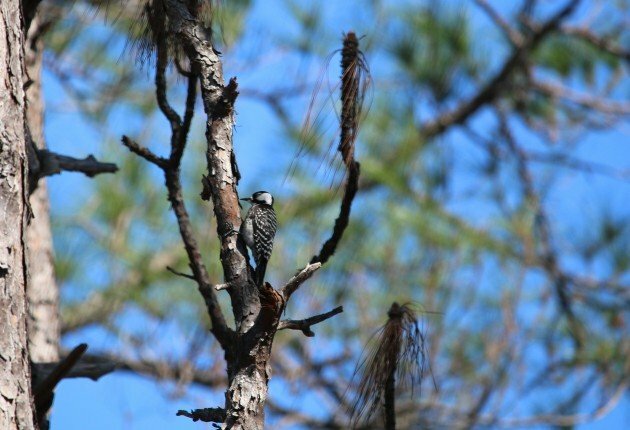 I wish them luck on their upcoming nesting season; each and every Red-cockaded Woodpecker chick is critically important!